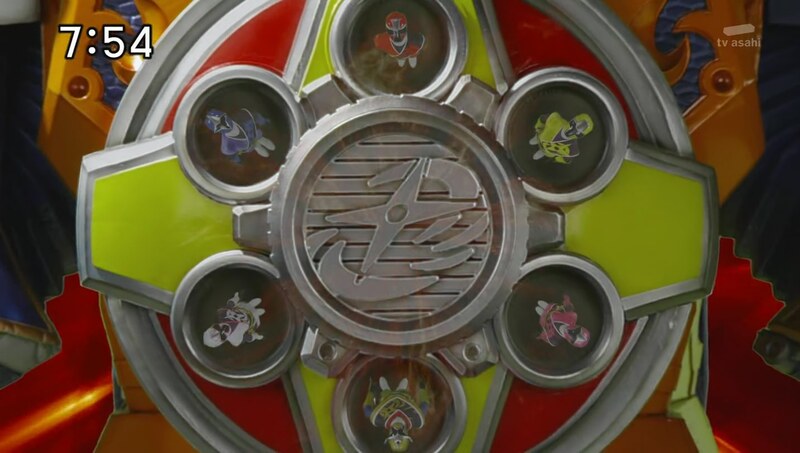 Recap: Shuriken Sentai Ninninger, Episode 32 – Gekiatsu Ninja! Acha! 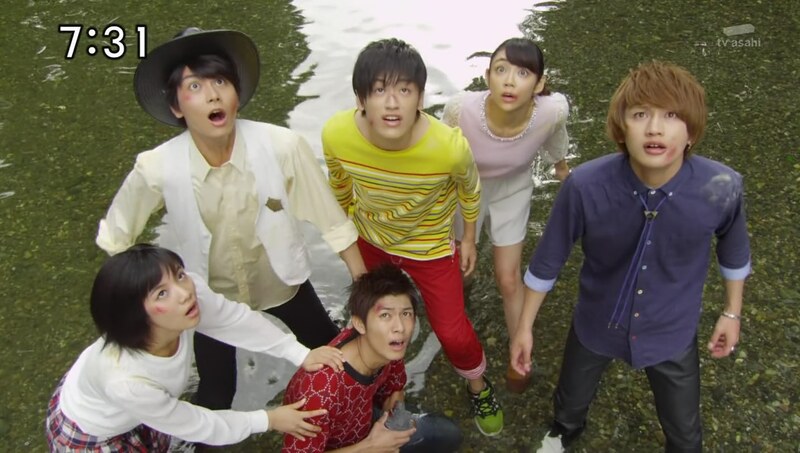 The others run to Takaharu who is thrown into the river after Lion Ha-Oh falls. Shishioh is not responding as Kyuuemon’s foxy pods fly over and attack them. Kyuuemon arrives to gloat, but Grandpa appears to face him. Grandpa continues to deny he has the Finishing Shuriken of the End, but Kyuuemon does not believe him. Grandpa criticizes Kyuuemon’s so-called Izayoi-style of fighting which involves sacrificing his comrades as pawns. He thought Kyuuemon was smarter than to give in to a weak heart. But Kyuuemon turns it around and says he learned it from Grandpa who created Lion Ha-Oh as a pawn to serve him and recruited Kyuuemon just to help train Father. So they are the same. Grandpa says Kyuuemon’s mind has become even more narrow now. They unleash advanced Ninpou at each other with Grandpa getting thrown back in the water. That allows Kyuuemon to unleash a Crossfire Technique. But Grandpa has no choice but to use some kind of bright ninpou to get him and his grandchildren outta here. They’re back at the dojomanse and have called Tetsunosuke over. He says Shishioh is not dead, but it will take him a while before he can fix the changer. As they let Grandpa rest, the Ninningers hope to find a way to defeat Kyuuemon and his karakuri to end this once and for all. But their OtomoNin are out of commission right now. Kasumi has an idea. She asks Tetsunosuke if they can make their own OtomoNin and he says they should try. The Ninningers each design their own OtomoNin as Tetsunosuke explains they are merely vessels which will be filled with souls using their ninjutsu. But when the Ninningers attempt to do so, it doesn’t work. Kyuuemon realizes the bright power Grandpa used earlier was of the Finishing Shuriken of the End. So he does indeed have it. Mujina pops up, still alive. Masakage is not happy with Kyuuemon using the royal guards as mere pawns. Ariake no Kata interrupts the conversation because they’re out of fear and she needs to keep the wrinkles away. Mujina offers to gather fear and take care of the Igasaki clan at the same time. Ariake no Kata tells Kyuuemon to let Mujina borrow his mallet. The Ninningers are back at home and wonder why their OtomoNins can’t hold souls. They must be doing something differently from what Grandpa had done. 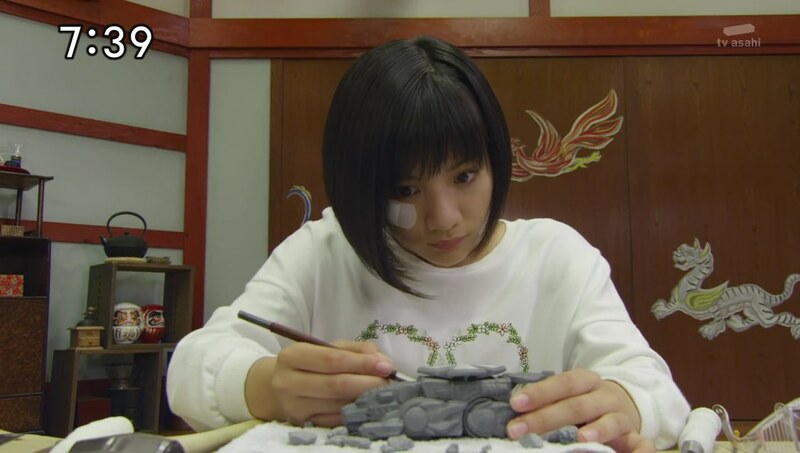 Takaharu wonders if they really can do this like Grandpa did. The others say they have to to help Grandpa. Mujina summons two Gashadokuro and the Gamagama-jus alert the Ninningers. Takaharu gets ready to run out, but the others say they still don’t have any OtomoNins. He says they can’t just ignore the threat. But at the same time, doesn’t it feel weird that they’re still weaker than Grandpa, but are using his ways which Kyuuemon was able to beat? Anyway, Takaharu will do anything he can in the meantime. He runs out. Nagi and Kinji follow. Yakumo is frustrated that they always run out without thinking. “He’s simple, isn’t he?” Tetsunosuke says. Fuuka apologizes for her brother being dumb. “But, I didn’t say he was wrong,” Tetsunosuke smiles. 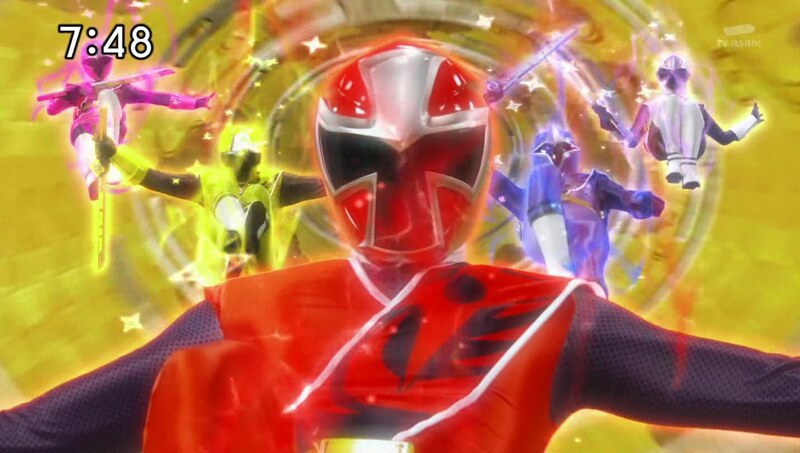 Takaharu and Nagi try to fight Mujina while Kinji hops onto Rodeomaru to take on the Gashadokuros. 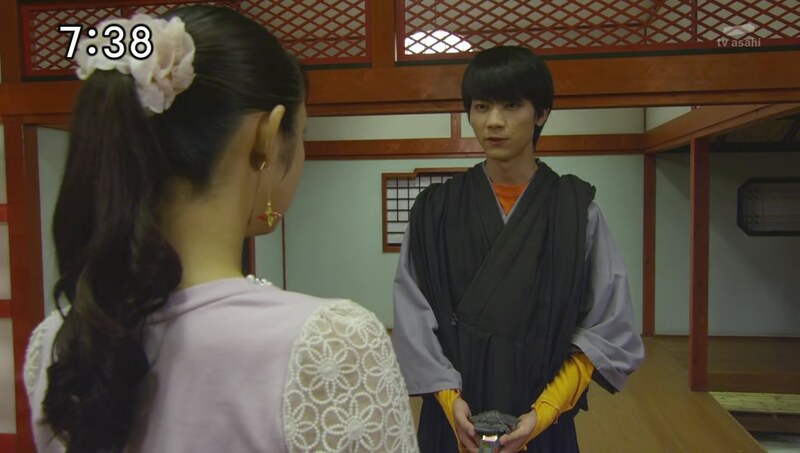 Tetsunosuke believes Takaharu meant that while Grandpa has his methods, they should also have their own. And with that, all Takaharu knows to do is to plunge ahead. 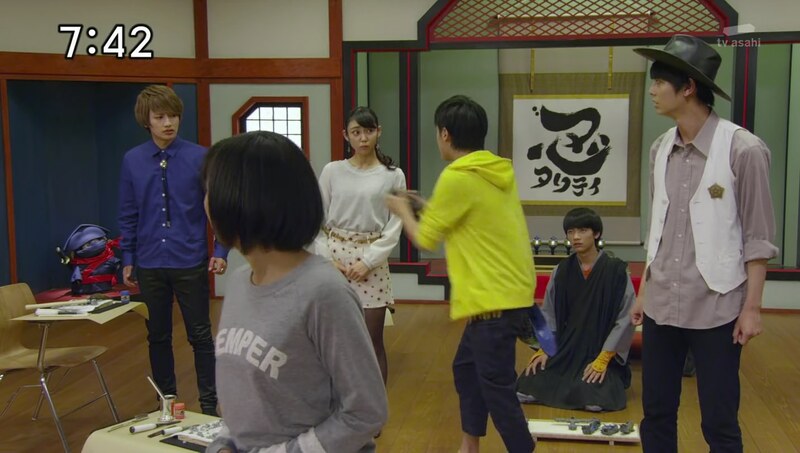 Yakumo, Kasumi and Fuuka marvel at Tetsunosuke being able to understand Takaharu. Grandpa watches them as Yakumo, Kasumi and Fuuka understand. 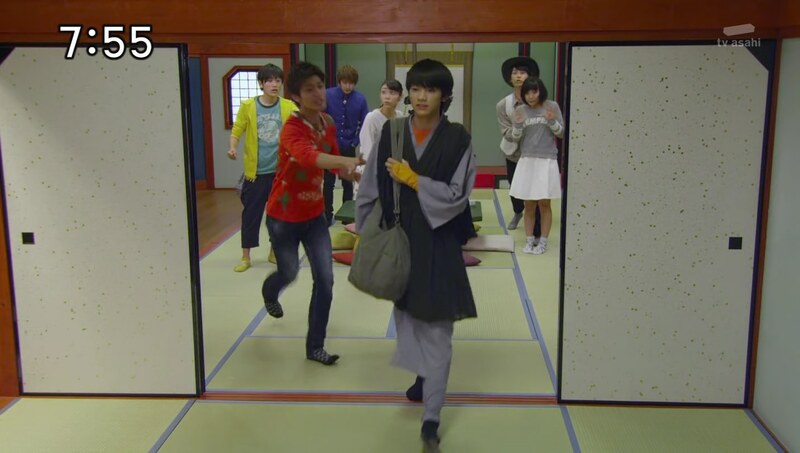 They hurry out to join Takaharu and Nagi. Takaharu and Nagi are surprised they’re here with the OtomoNin still unfinished. But they explain how they shouldn’t be limited by Grandpa’s methods and instead should just push forward. That’s their method. The Ninningers fight Mujina and together deliver a Ninja Flash finisher. Mujina is still standing and decides to use Kyuuemon’s mallet to embiggen himself. Kasumi says all they can do is plunge in. But Takaharu has a better idea. He says he’ll use Nagi’s Possession Fusion Technique and combines a Gattai and Henge no Jutsu. 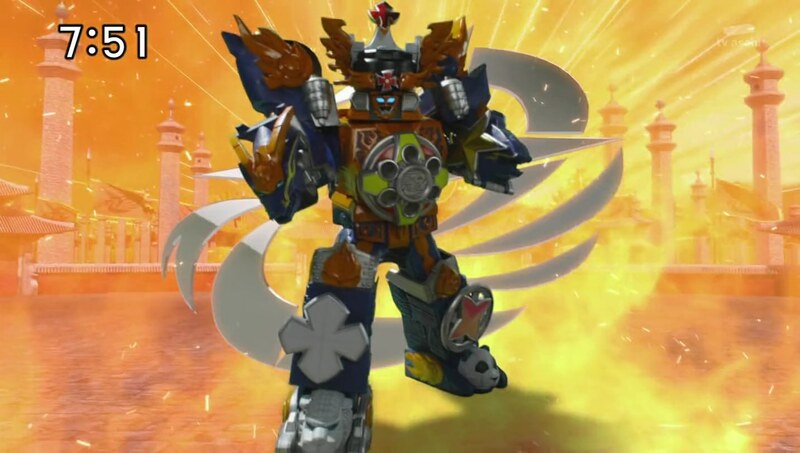 That allows Takaharu to fuse into his OtomoNin to become the phoenix-like Hououmaru. 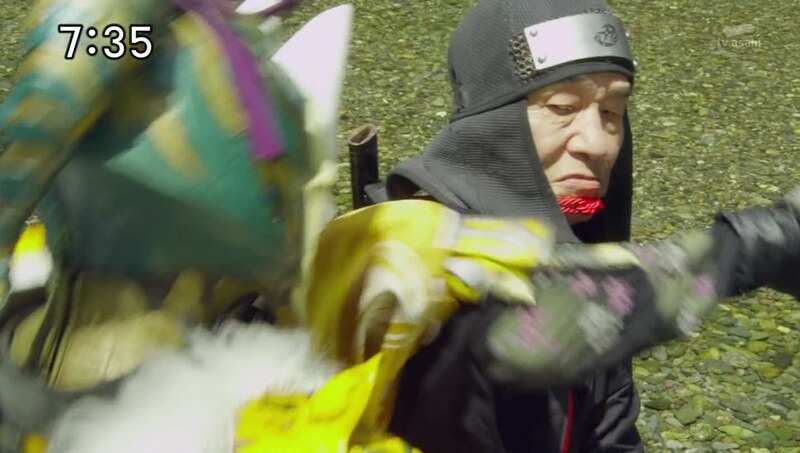 Grandpa watches as Takaharu flies around, attacking Mujina and the Gashadokuro. He is pleased by what they have accomplished. 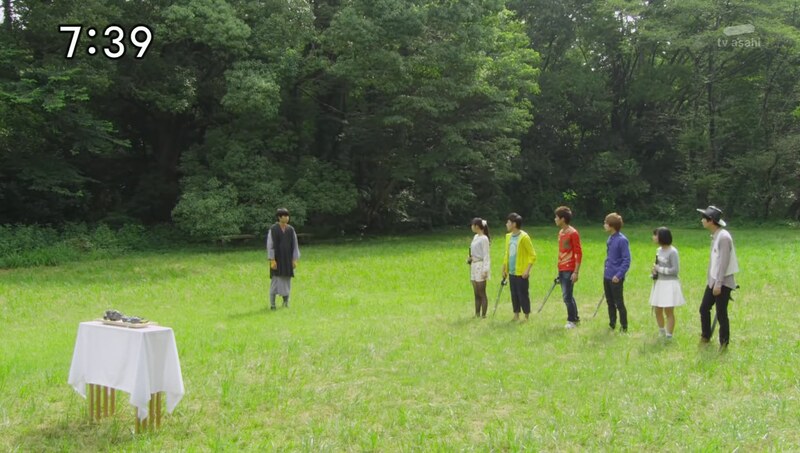 Kinji gets thrown off Rodeomaru and joins the others. They all use the technique to fuse themselves into their own OtomoNin. Yakumo is dragon-styled Seiryuumaru, Nagi is a tortoise-styled Genbumaru, Fuuka is a white tiger-styled Byakomaru, Kasumi is a panda-styled Pandamaru and Kinji is a black carp-styled Magoimaru. The Ninningers fire at and destroy the Gashadokuro in one go. They then decide to combine into Gekiatsu Dai-Oh. 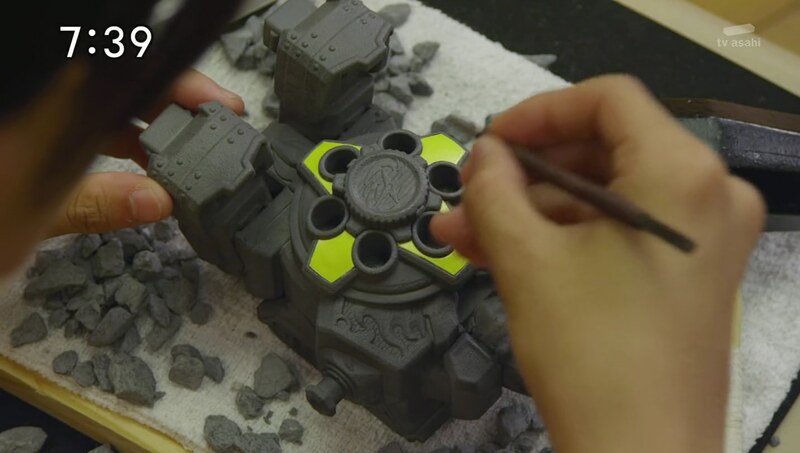 Each of Ninningers take out a Sealing Shuriken which turns into brand new Hot Shuriken for them to use. Just as the Ninningers get even more fired up, Kyuuemon stabs Mujina in the back. Literally! Mujina explodes and Kyuuemon dosen’t care. He decides he needs to destroy the Ninningers and their brand new OtomoNin now while he has the chance. They battle. Grandpa laments his mistakes and shortcomings in teaching Kyuuemon. But to make up for it, he sees his grandchildren forging a clear path to become the Last Ninja and eventually surpass even his power. Kyuuemon tries another one of his fox pod attacks, but it’s no use. The Ninningers use all their new tricks to pin Kyuuemon back. He can’t believe it. The Ninningers use a Gekiatsu Dai Fever attack in which they themselves get shot out of the chest cannon to deliver the final strike. The Ninningers land back on the ground as Kyuuemon’s karakuri falls, presumably with him in it. Back at the dojomanse, Tetsunosuke agrees the Ninningers’ own methods are hella hot. But he won’t let them beat him. He’ll be sure to fix Lion Ha-Oh as soon as possible. 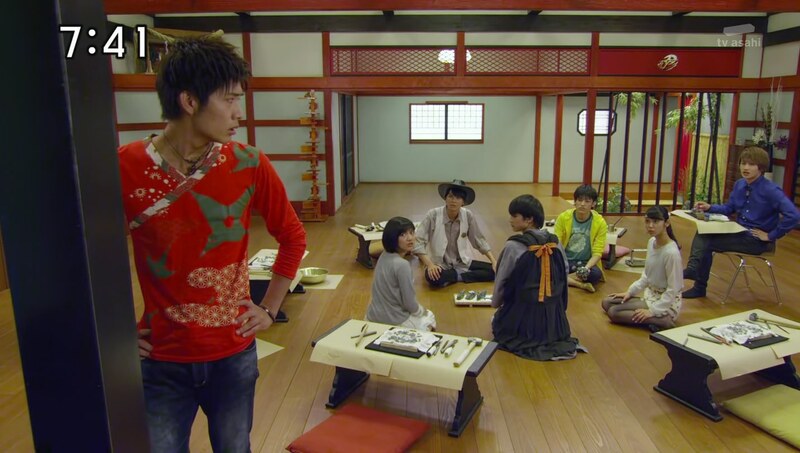 Takaharu comes up with a strange saying and the Ninningers try to get Tetsunosuke to translate. But he has no idea what he’s talking about. I thought this was a great episode. 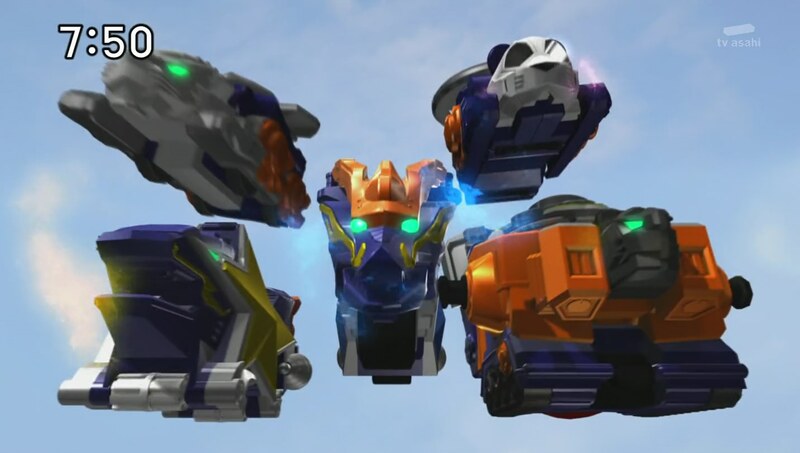 Definitely much more enjoyable than the typical toy introduction episode. I don’t think we’ve gotten much on the idea that the cousins and Kinji would ever surpass Grandpa or are a new generation of ninja. In the sense that, they’re talented and special in their own right and don’t always need to be trained by Grandpa or anyone else. They can forge their own path and have the power and the talent to do so. That gives much more basis for the idea that the new Last Ninja won’t necessarily be just one person, but an effort made by all six Ninningers. That would be the best ending I think. I really enjoyed Grandpa and Kyuuemon’s battle. That was done really well and it was great to finally see Grandpa actually fighting. I really hope to see more of them facing off as well as touching more on their backstory. There’s got to be more to Grandpa bringing Kyuuemon on and what pushed Kyuuemon to go bad. 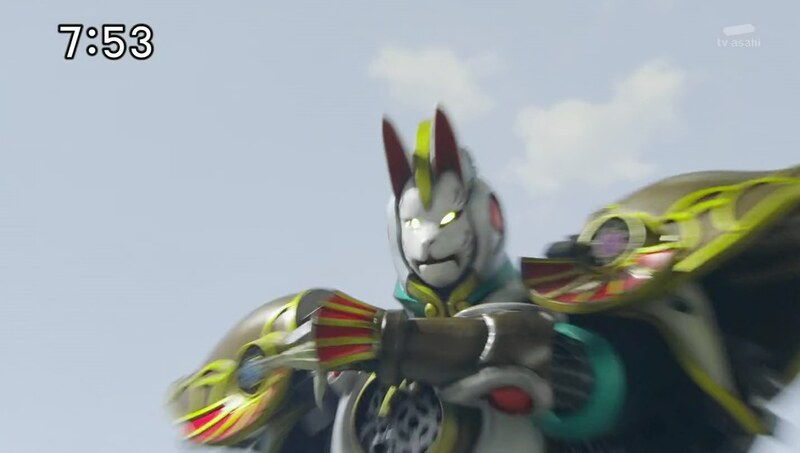 But I definitely liked Kyuuemon pointing out Grandpa’s not been on the up and up all the time either. Goes well with the revelation of Grandpa’s true feelings about Father. The morphed fight of the Ninningers and Mujina was also well done. The scenes of the Ninningers, as OtomoNin, flying around was definitely fun and awesome. I like the idea of them becoming the mecha. It’s been a while since Mystic Force (or Magiranger, but I watched Mystic Force only. 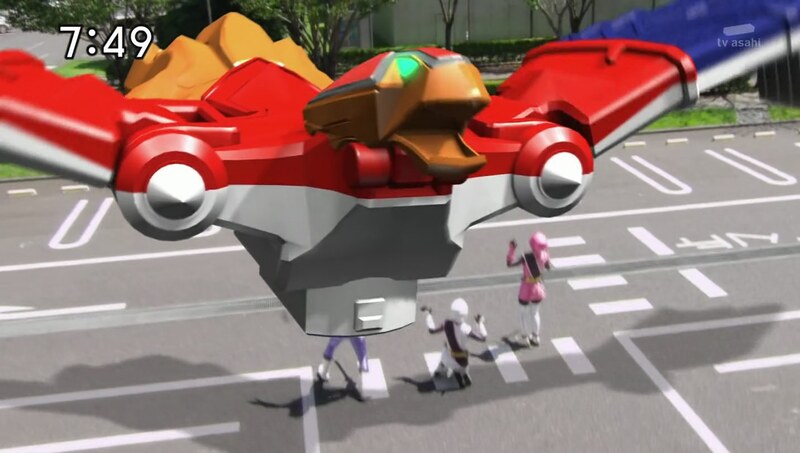 =D) I also think it’s great since apparently this is the first time a base mecha combination includes the 6th Ranger! That’s pretty awesome. One great thing that I enjoy about the mecha this season is the increased mobility of them. Of course, we have Shinobimaru and Rodeomaru hopping and flipping around all over the place. But Gekiatsu Dai-Oh was also able to more freely move. That’s a nice chance from the big, blocky mechas that have been the norm (but also equally awesome of course). It’s a refreshing twist. The music felt and sounded different this episode. Not sure if its new music, maybe for Gekiatsu Dai-Oh. Or if they just used the existing pieces of music in different ways. But it definitely sounded a little more exciting and epic. It was definitely great to see Tetsunosuke again too. Overall, a great episode. 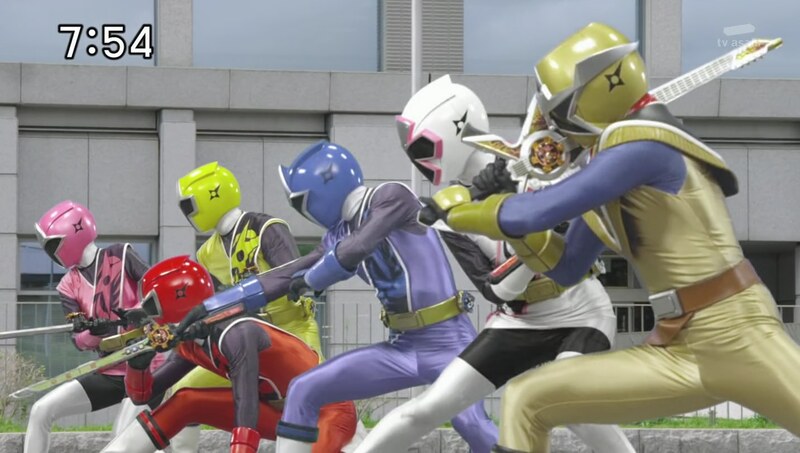 Hope Ninninger continues with the great momentum. 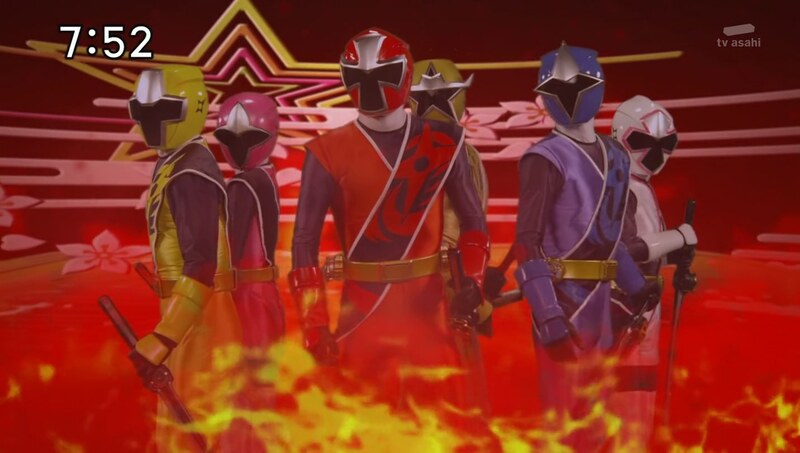 ← Recap: Power Rangers Dino Charge, Episode 13 – "I'll fart when I want to!"